With just 4.2 percent of the global mobile phone market, Apple's iPhone accounts for a massive 51 percent of the total profits, a new report claims. Apple continues to dominate the market when profit is measured, according to a new report from Asymco's Horace Dediu. The iPhone maker managed to add one percent to last quarter's 50 percent share of profits from the top eight mobile phone vendors in the December quarter, the report noted. After data for the fourth quarter of 2010 was released last week, Apple placed fifth overall among global cell phone makers with 4 percent market share. Meanwhile, research firm Canalys published a report Monday showing that Google overtook Nokia as the top smartphone platform maker in the fourth quarter. Apple revealed earlier this month that it sold 16.24 million iPhones in its first quarter of fiscal 2011, resulting in $10.5 billion of revenue for the company. Additionally, the average selling price of the iPhone increased from approximately $610 in the previous quarter to $625. The Cupertino, Calif., company hit a major milestone in the December quarter when it passed Nokia to become the world's largest mobile phone vendor in terms of revenue. 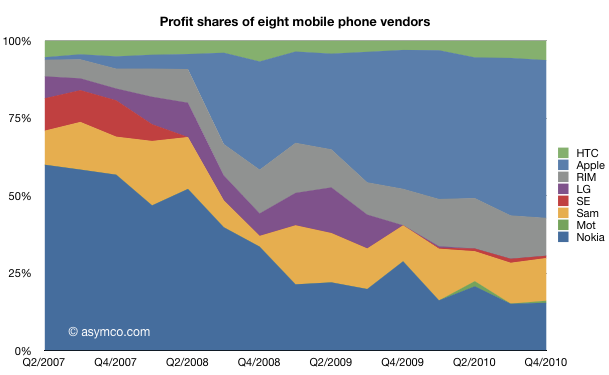 The iPhone's share of global handset profits has been steadily climbing. In August of 2009, Apple was reported as making 32 percent of the industry's profits. 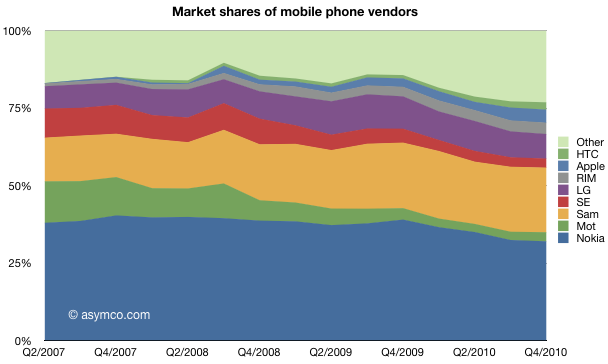 iPhone profits could continue to soar as Apple adds the new CDMA iPhone 4 to its lineup. According to Apple's Chief Operating Officer Tim Cook, the launch of the iPhone 4 on the Verizon network will not adversely affect the iPhone's ASP and profit margins. After being speculated for years, the iPhone will come to the nation's largest carrier on Feb. 10. Verizon is conservatively projecting sales of 11 million iPhones in 2011, but executives have said that the handset could help the company's growth "really explode over the next several years." According to a recent analyst survey, Verizon could see as many as 25 million new iPhone subscribers this year.